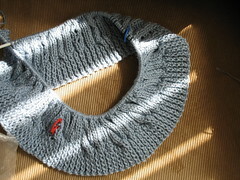 From No Sheep for You - the Tuscany Shawl. 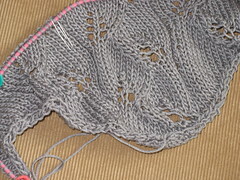 I am using Elann's Sonata in Grey Slate. 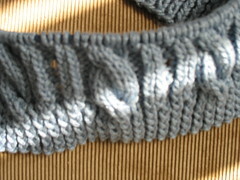 Same book, different chapter: The Cables and O's sweater - using TLC Cotton Plus in Medium Blue. The first few rows went really fast, and now it's slowing down a bit. But it's a really easy to follow pattern. I watched the "Knitty Gritty" scarf episode and realized it was a sign. I had purchased a bunch of skeins of Classic Elite Premiere last fall during a change of seasons sale in Burnt Orange, Keylime, and Almost Green. And it was sitting around until I figured out what to do with it. Well, it turns out that just what you use for the Skinny Scarf. 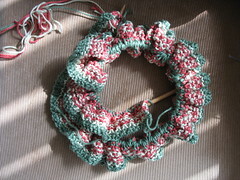 I used a slightly different version of the woven stitch. It goes really fast. 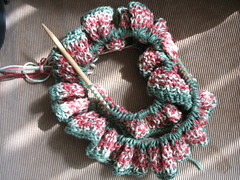 It makes no sense, each row is 400 stitches, and yet, it really whips by. It looks cute from the back too.